Today was another adventure in sauce making. Can you tell I have off for a few days? I went back to the cookbook and found a pan jus based sauce. Thus one called for an onion purée to thicken the sauce. So on to the vegetable purée section. Turns out to add flavor and texture to a pan sauce, a vegetable purée can be added in place of a roux or flour/cornstarch. And since I had the time … I made my first attempt at a stewed onion purée. I will admit to changing the recipe a bit – even though I shopped this weekend, I did not have five pounds of onions on hand. 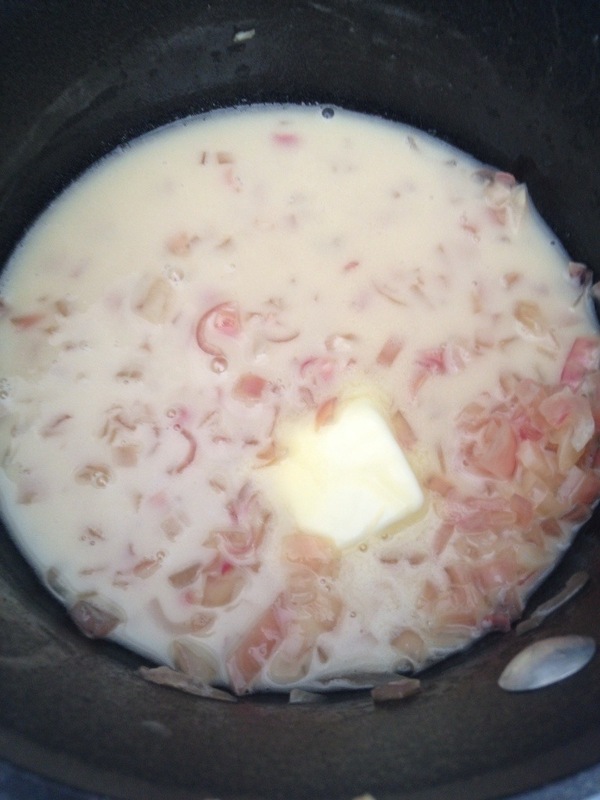 But I used two and a half (about 4 large onions) with two pats of butter – maybe two ounces total. 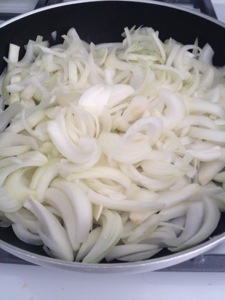 The recipe is pretty specific that you need to sweat the onions and do not let them brown or caramelize. (I think a carmaelized onion version of this would be fantastic and may have to try it soon.) So the onions cook down with lots and lots of stirring. I may have stopped cooking a little soon, but the onions were soft and translucent and all the liquid in the pan had evaporated. I added a quarter cup of cream, mixed it well then puréed it the blender until it was almost smooth. It looks like mashed potatoes; I did decide to not strain the mixture. I wanted to see what it was like unstrained and figured it would be easier to strain later if need be. 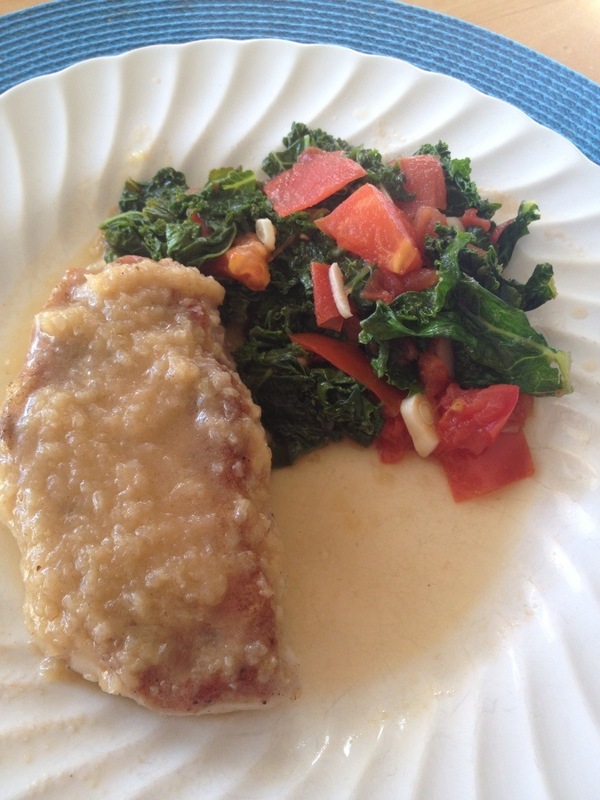 So the pork – one butterflied pork chop with salt, pepper and ground thyme. Into a hot pan with olive oil, and cook until done. Remove the chops, pour off the oil (I poured it into the pan for the kale and tomato) and deglaze the pan with a half cup stock. I like veggie stock, so that is what I used. 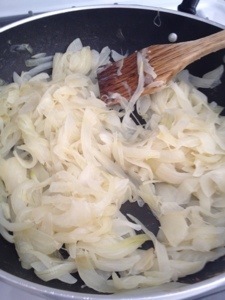 Reduce and then add a few tablespoons of the onion purée. Here is where I deviate from the recipe. I added the onion purée and then a splash of whiskey. Just a small splash, but I thought it needed something. Back into the pan went the pork just to meld the flavors a little. I really like the way this came out. Bob even declared it one of my best pork dished yet. And since I now have plenty of the onion purée in the freezer (in individual portions like I did with the leftovers of the broken sauce from yesterday) this is a quick weeknight meal now. After all these meat dishes lately, I think tomorrow will be a tomato and leek quiche -crustless that is. 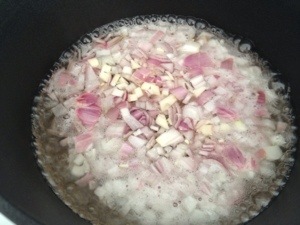 The directions looks pretty simple – half a cup white wine, half a cup white wine vinegar (I substituted white balsamic vinegar as that is what I had on hand) with 3 ounces chopped shallots. 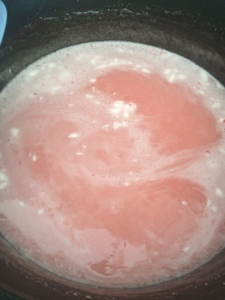 Cook until almost all the liquid has evaporated. 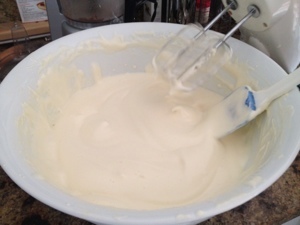 Then add a quarter cup of cream. Add a pound of butter and whisk over high heat until all the butter is incorporated. This would be where I made my mistake. I should have either added all the butter at once over high heat or added it one piece at a time over low heat. Instead I added it one piece at a time over high heat – almost like I do for the famous French Silk Pie – but over heat. The results were a tasty, but broken sauce. It did taste good. And it worked over the chicken and brown rice (from my veggie basket this week – go figure) and veggies. All in all, not a bad meal. I think I can get the sauce right next time. But in the mean time. I am freezing portions in muffin tins to make a base for future sauces and meals. Can’t let a pound of butter go to waste! Santa arrived at the grandparent’s house this year. 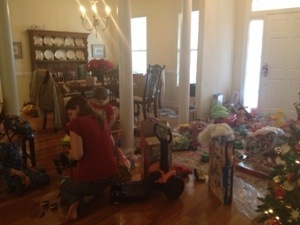 All the boys awoke to sacks of presents. 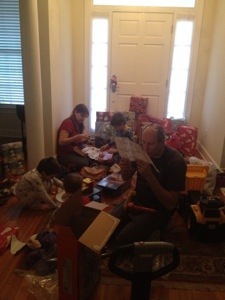 Everywhere you looked there were more gifts to open. Bob did like the present in his very big box. 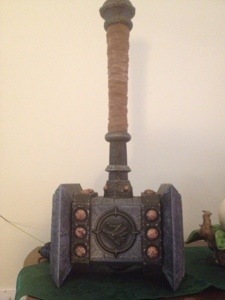 the Doomhammer for WoW. I figured it would go with the very large sword from a few years ago. Now he just needs to find a place to put it. My boxes were much smaller, but arguably much better. 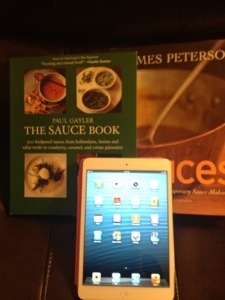 Two sauce cookbooks and an iPad mini, with a pink cover! Bob knows me well and I have to say I’m about three hours into using the mini iPad and I love it. The weight is prefect, and the screen is amazing. This will probably replace the regular iPad (I have Bob’s original one – first generation iPad) and my Nook – which is wonderful, but heavy comparatively. We also had a lovely feast this afternoon. 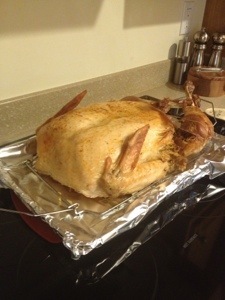 Our first ever tur-duc-in. Turkey, duck and chicken with stuffing all in one. Pretty good even to someone who is not a turkey fan. The wild rice casserole, cranberry sauce, etc, etc. and the desserts … Chocolate pecan pie, pecan pie cheesecake, chocolate pie … Lots and lots of sweets. Now it’s time for a nap. Merry Christmas everyone. And all through the house, all the creatures were stirring, but thankfully not a mouse. In hopes of a fabulous Christmas feast for a hunger to slake. Ok, that is the best I have today. (with help from Bob after a very strong beer.) It’s not very good, but it is in the holiday spirit. And it leads nicely into my day of baking. 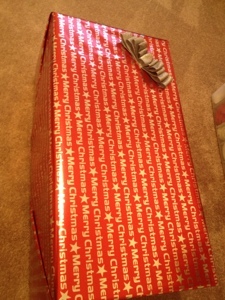 My Christmas prep adventure stared with my attempt to wrap Bob’s present. 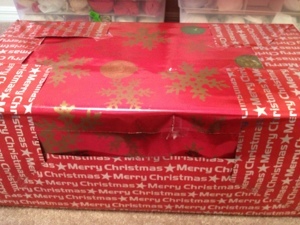 The box is larger than it looked and when a new roll of wrapping paper failed to cover it, after trying a few other rolls first, I improvised. I’m claiming the double paper in an effort to be more festive, but really, I don’t think I had much of an option. 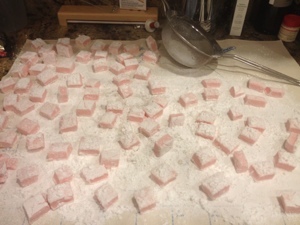 But the baking started yesterday with the peppermint marshmallows. I found the recipe last year and decided I had to try them. While not technically difficult they are a little time consuming. 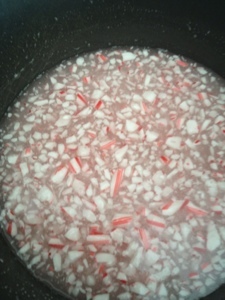 Corn syrup, sugar, water and salt combine with crushed peppermint candy to make a sticky, sweet oh-my-it-burns-when-you-accidentally-touch-it goo. That isn’t a bad thing, but it is a warning. 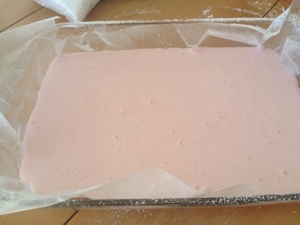 Making marshmallows also involves a lot of whipping and some creative use of confectioners sugar. 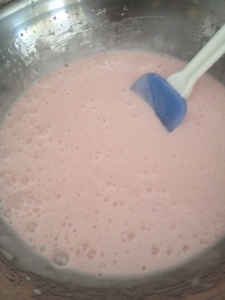 Every surface the mixture will touch needs to be coated in confectioners sugar so it doesn’t stick – because trust me, if you leave even a little not coated, it will stick. 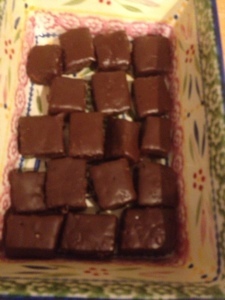 Bob helped with these today – he cut the marshmallows into little squares for me. That may not sound like a lot, but given my inability to cut a straight line and all the other baking I was doing, it was huge for me. The results when covered with a bittersweet chocolate are perfection. Even Bob who does not like marshmallows has indulged in several at a time. My other baking adventures today included the pecan pie cheesecake with the yummy goodness topping and a caramel chocolate pie. 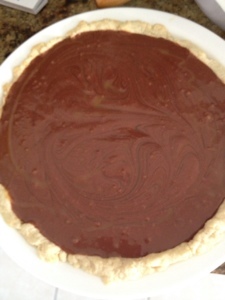 Now the cheesecake is easy … No real issues there, but the chocolate pie sometimes makes me question my sanity. Do I make it because I love the pie, because it gives me an excuse to ask Bob to rub my shoulders, or because it is just one of those things that you make just because. Probably all three, but mostly because it is such a good pie. Not an easy pie, but it is darn good. Worth every second of shoulder pain for this one. 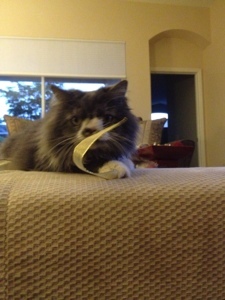 And just because she is super cute, a gratuitous picture of Miss Leia who helped with all the wrapping. One of the thing that I remember most about Christmas time is the Crèche. It, for some reason, has a prominent place in my mind when I picture Christmas as a kid. 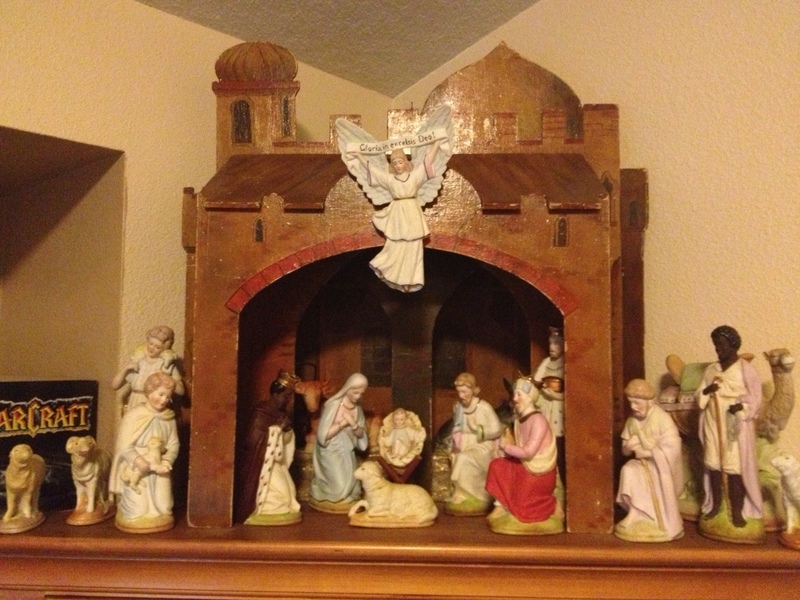 Whether at Grandmom’s or our house, I see the lit nativity … And hear dad as he tried to get the wires right every year. 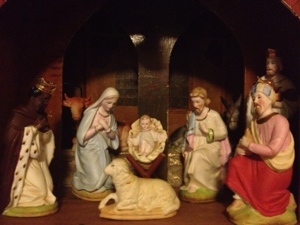 We’ve had he manger for a while … Housing the troll and cow bride and groom from the wedding cake, but now it holds the full scene. Thank you Val for letting me have it. We were a little concerned about the space, but with the exception of the palm trees that no longer exist, the star that I could not get to stay and the icicles that I could not get hung, everything fit. Bob did surgery on one wise man and one shepherd. I think it looks pretty good. 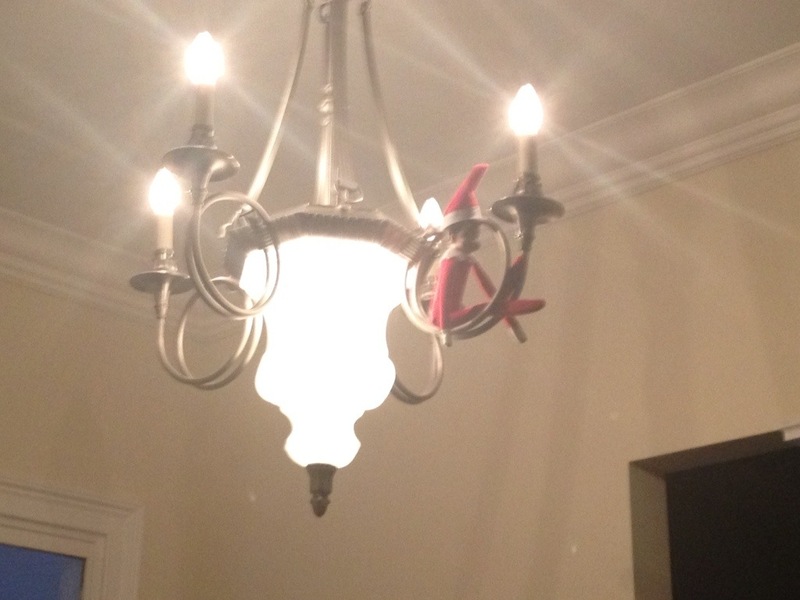 Maybe next year I will ask Bob to tackle the lighting and figure out the icicles. This year, I just wanted it up. There was not much food news this week. I was fighting a cold (the cold won Thursday) so it was take out and soup this week. 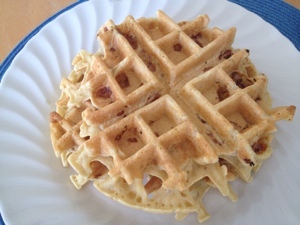 Today I felt well enough for simple dishes so for breakfast I made banana pecan waffles. I know, they don’t look like much, but the pecans are the ones Mom (Bob’s Mom to be clear) sent us from the grove in Georgia. We know fresh ingredients make a huge difference, and honestly, nuts are no different. Yes, they last forever if kept in the freezer, but really, if you ever get a chance, go for fresh. It becomes very hard to buy them in the grocery store out of season. The bananas came from my veggie basket last week so they were super ripe and super sweet. Perfect for waffles. 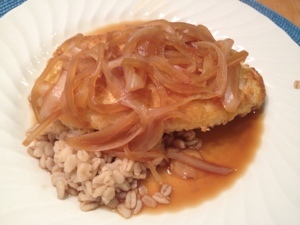 Dinner was a Japanese comfort food dish … Chicken cutlets crusted in panko with an onion sauce. 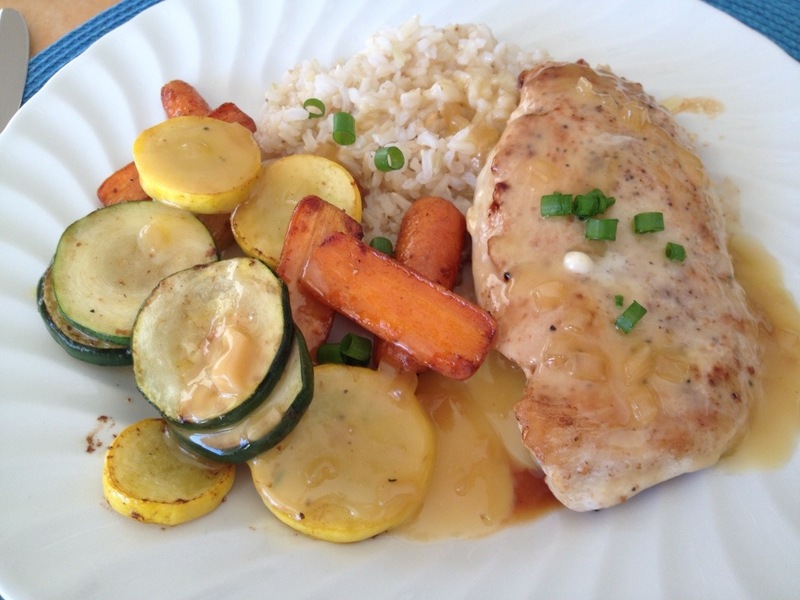 The original recipe calls for pork, but I had chicken, so we used that and I replaced the rice in is with barley. Used what I had on hand. The sauce is on onion, sliced thin, one cup chicken or veggie broth/stock, one quarter cup soy sauce, one quarter cup miran, a few slices on ginger and a pinch of sugar. Let it boil then simmer until it reduces (about a half hour total) just a little and the onions are soft. The chicken is dredged in seasoned flour (just salt and pepper) then in egg, then in panko bread crumbs. Pan fry in a little oil and it’s a dish. Not the best/healthiest dish out there, but darn good. And I got a chance to use my fancy new thermometer. 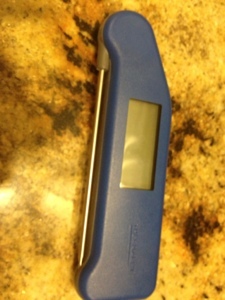 I have Mom and Dad’s mailbox luck with kitchen thermometers. No matter what, I kill them. They die quickly and sometimes dramatically. Given that, I was hesitant to spend the money on a really good one, but I heard so much about these, and well … I made the mistake of asking Bob if I should get one. I should have know the answer … this is the man who bought his own laser. Thermoworks makes these (by hand according to the website) in England and every review I read gushed about them. So I got one. And I have to say, I love it. Three seconds (tops) to get an accurate reading. It actually gave me two reading in about one second. Clear temp display and easy to keep clean. And it just looks cool. It is a good thing they are expensive or I would be tempted to get multiple colors. The cats were in super cute form. 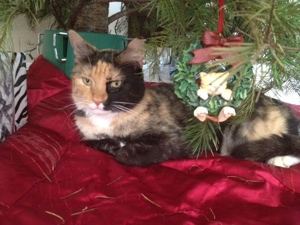 Leia kept moving from the tree when I tried to get her picture, but the other two did let me get theirs. Happy one more week to Christmas! A few months ago Bob asked if I would go to a concert with him. 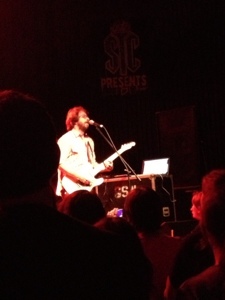 Jonathan Coulton does geek/nerd Indy Rock type music. Songs like Code Monkey and Artificial Heart. You know, geeky songs. Upbeat and fun, but listen to the lyrics and it is … Interesting. 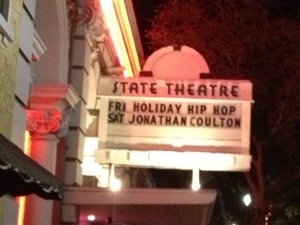 So, knowing how much Bob likes this guy, and it was in St. Pete, so not far … sure, I’ll happily go. But what he didn’t know (or forgot to tell me) was that there are no seats to this show. 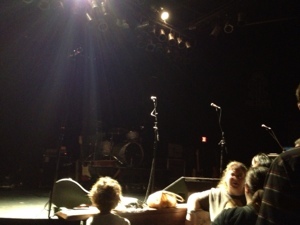 Standing only in a small front of the stage area. Mosh pit comes to mind, but I was told I can’t really say that as there was a good two feet between people, but I’m not sure. I had to watch the rather large purse of the girl in front of us to ensure I didn’t get hit as she danced. But, I will say, we had a very clear view. 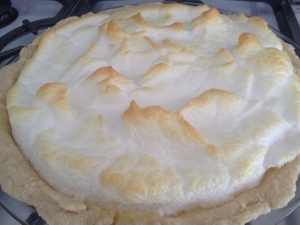 With the really, really long week, I didn’t do much cooking, but today I did a lemon meringue pie. We are heading to a friend’s for dinner, and dessert is my contribution. If anyone remembers the old Tasty Cakes, the ones before they began shipping all over the country, this pie is very reminiscent of the original TastyCake Lemon Pies. 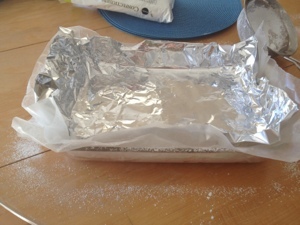 Flaky crust (1 stick unsalted butter, 1.5 cups flour, 1/4 to 1/3 cup water – process, roll into a ball, refrigerate for 20 minutes, roll out, bake at 350 for 10 minutes …. you have crust) with a creamy, lemony filling and fluffy meringue. This is based on an Alton Brown recipe, but I, of course, changed it. 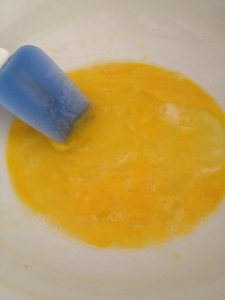 Zest of two lemons, juice of three, sugar, corn starch, water, salt, butter, egg yolks and done. Hopefully it tastes as good as it looks. I had to add the juice of a lime today as I only had two lemons. Oh well, we’ll see how it tastes later. Somehow I still have not received my Wimbledon Ballot. Mom and Dad got theirs, Erin got hers, but I’m still waiting for mine. I have high hopes for getting tickets this year; it would be nice to check another thing off the “to do” list. 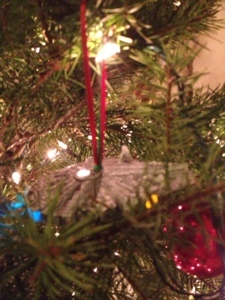 Yes, every year when the tree begins to go up, I use the same song for the title every year. Let’s just call it tradition. 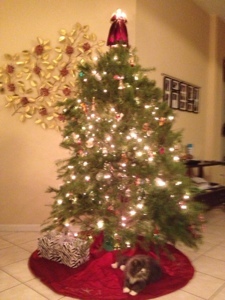 There was a debate about the tree this year, pretty much between me and my little brain. I wanted a tree larger than the little tabletop tree, but I didn’t want to mess with the nine foot artificial one in the attic. So … Bob and I went out Saturday and found a five and a half/six foot tree. Live tree. 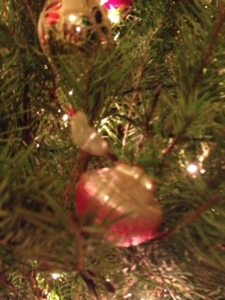 Yes, I am being brave this year and taking a chance with a live tree, glass ornaments and three cats in the house. 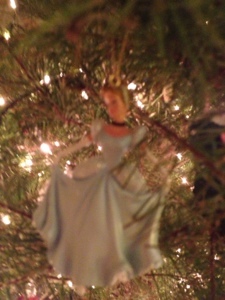 and I got Cinderella on the tree. I think Cinderella is the better ornament as she does have the best shoes. 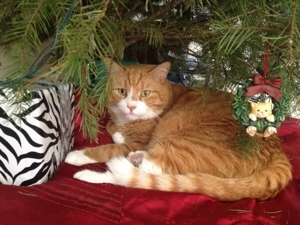 Bob doesn’t think that is all that important in deciding the cool ornament criteria. I still contend shoes are highly important. This was a total experiment. 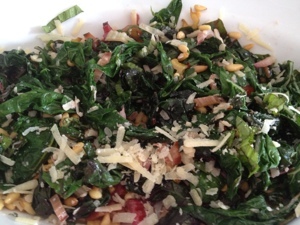 I toasted pine nuts in sesame oil then tossed the chard with garlic and salt and wilted them down. 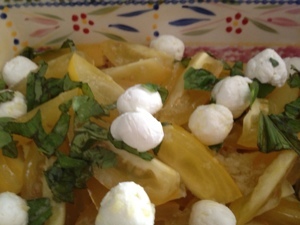 I added Parmesan cheese and tossed it all together with basil. Dad thought it was good, Mom and Aunt Dolly had seconds and Bob declared it “a definite do again.”. Experiment a success! One a side pet note, Gracie hated her pretty pink, sparkly bell collar so much she took it off. No clue where it is, she came home one evening with it totally gone. How she managed to get out of a buckled collar, I do not know, but really wish I did.